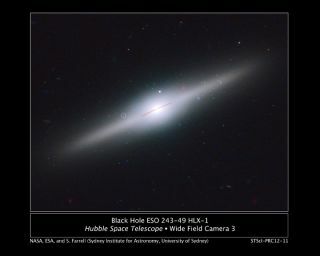 This spectacular edge-on galaxy, called ESO 243-49, is home to an intermediate-mass black hole that may have been stripped off of a cannibalized dwarf galaxy. Like a fossil hinting at a long-gone animal, a black hole is offering clues about a now-destroyed galaxy that may once have existed around it. The Hubble Space Telescope recently spied a cluster of young blue stars surrounding a rare mid-weight black hole that suggests the black hole was once at the center of a dwarf galaxy. Astronomers think this galaxy was torn apart by the gravity of a larger host galaxy that it orbited. The violent encounter would have stripped away most of the dwarf galaxy's stars, but it also could have compressed the gas around its central black hole, triggering a new wave of star formation. It is these new stars that Hubble recently saw signs of. The observations suggest that the young stars must be less than 200 million years old, meaning the collision between the parent galaxy and its dwarf likely occurred around that time. Besides revealing clues about the lost galaxy, the black hole itself, called HLX-1 (Hyper-Luminous X-ray source 1), is scientifically interesting, researchers said. When Farrell and his colleagues discovered HLX-1in 2009, it was the first intermediate-mass black hole known. Scientists think it may represent a class of middleweight black holes that are the building blocks for the supermassive black holes lurking at the center of most large galaxies, including our own Milky Way. "This black hole is unique in that it's the only intermediate-mass black hole we've found so far. Its rarity suggests that these black holes are only visible for a short time," said Mathieu Servillat, a member of the research team who conducted his work at the Harvard-Smithsonian Center for Astrophysics in Cambridge, Mass. This specimen contains the mass of about 20,000 suns, and is located roughly 290 million light-years from Earth. In comparison, the supermassive black hole at the center of the Milky Way is as massive as 4 million suns. By studying this rare middleweight black hole, scientists hope to learn more about how they, and their larger supermassive brethren, form. "For the first time, we have evidence on the environment, and thus the origin, of this middle-weight black hole," Servillat said. The researchers report their findings in the Feb. 15 issue of the Astrophysical Journal Letters.